Moshi's Mythro Air are quality Bluetooth earphones at an affordable price. Moshi’s Mythro Air wireless earbuds look good and sound good. 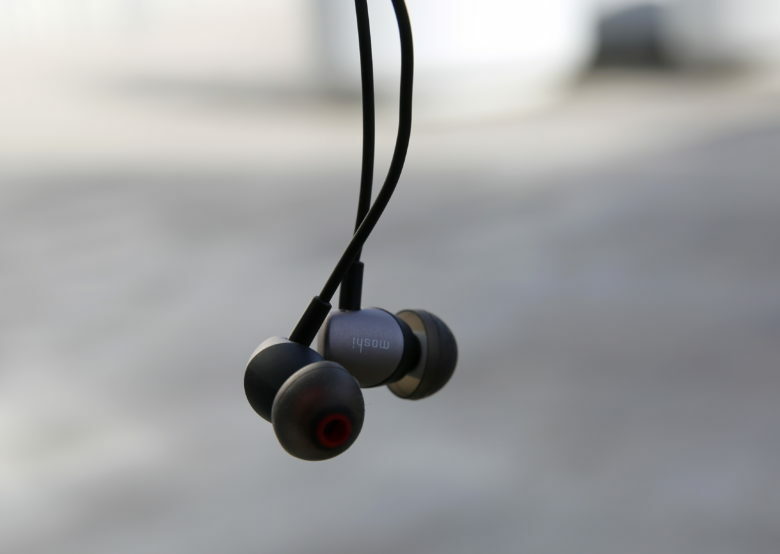 They offer all-day battery life, a clever magnetic clip to keep them in place, and a unique feature that allows you to share music from a single source to two sets of Mythro Air earbuds. Best of all, they cost $69.99, and sound better than premium earbuds costing two or three times more. Moshi’s Mythro Air earphones have inline controls and a clever magnetic clip. 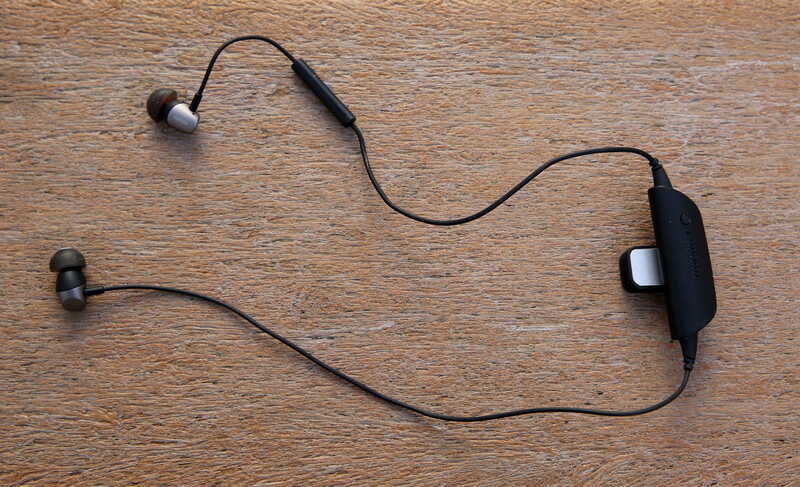 Like most of Moshi’s products, the Mythro Air earbuds are well-designed and well-made. They are constructed from durable aluminum that comes in three colors — Gunmetal Grey, Burgundy Red and Jet Silver. There’s an in-line control with a microphone and volume buttons. Phone calls sound clear at both ends. The battery pack is beefier than some competing products. Moshi rates the battery at eight hours, which is roundabouts what we got in tests. Moshi’s Bluetooth Audio app shows the battery level (which is also displayed in iOS 10 on the iPhone’s status bar when connected). The app also includes a low-power alarm, equalizer, presets and auto power off. Bluetooth pairing is easy and straightforward. Moshi’s DJ4two feature allows a second pair of Mythro Air earbuds to be connected to the same source, which proves handy for sharing music or watching a movie with somebody else. We tested it with the kids watching shows on my iPhone 7 in the back of the car. Apart from fighting over what to watch, it worked fine. Included are three sizes of soft silicon ear tips that offer good sound isolation and really pump the bass with a snug fit. 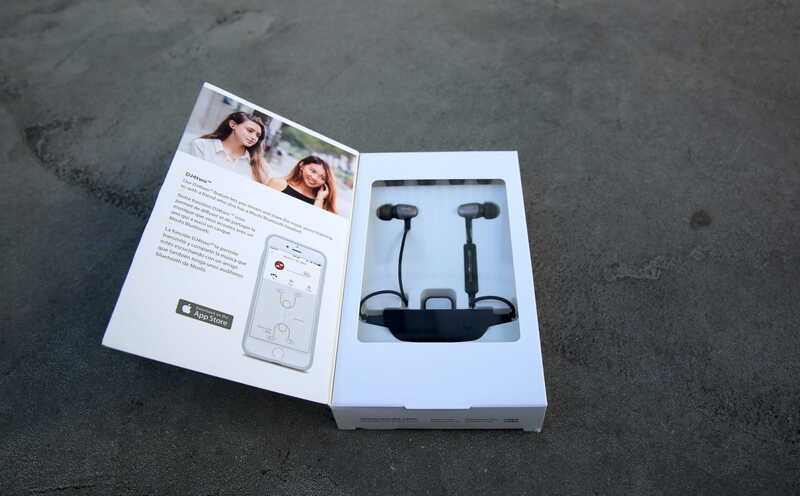 Wearing the earbuds is comfortable and unobtrusive, especially with the clever magnetic clip, which keeps them in place while exercising or on the move. At $70, Moshi’s Mythro Air Bluetooth earphones are a solid choice for the gym. So how do these Bluetooth earbuds sound? The sound quality is better than expected at this price. The Mythro Air earbuds are built around a pair of 8mm neodymium drivers that deliver frequency response of 15 Hz to 20 kHz (-10dB@1kHz). The commonly stated range of human hearing is 20Hz to 20kHz. They aren’t as open or wide as a set of high-quality wired headphones, but for most music, these Bluetooth earbuds sound clear and sharp, with solid bass and midrange. The Mythro Air buds sounded pretty great to my ears. I compared them to a couple of pairs of Bluetooth earbuds that cost $200 and $300 respectively, and they sounded better in my opinion. They have stronger bass and a warmer, fuller sound. I was surprised, frankly, and happy too. I’ve lost several Bluetooth earbuds, and I’d rather be out $70 than $300. Moshi’s reputation for quality goods at affordable prices is upheld by the Mythro Air earbuds. They punch above their weight in the affordable class, and are highly recommended for the gym. Moshi provided Cult of Mac with a review unit for this article. Check out more Best List reviews. Read Cult of Mac’s reviews policy.